218 pages | 9 B/W Illus. Exploring the remarkable story of China’s rise to global prominence, China since 1949 provides a concise yet comprehensive overview of the events that have shaped the country since the middle of the twentieth century. An updated selection of primary source documents. Also containing a chronology of events from 1949 to 2015, a Who’s Who of key figures, a glossary and a guide to further reading, China Since 1949 is an accessible and engaging introduction to China’s recent past and essential reading for students of modern Chinese history. "Benson presents an authoritative introduction to an essential chapter of world history. In a crisp narrative and well-chosen accompanying materials, she provides a solid foundation for understanding China in recent history and its global role today." 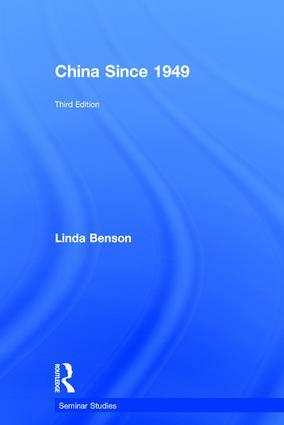 "Professor Benson offers a balanced and succinct introduction to the history of the PRC. A particular strength is her analysis of the challenges facing China, such as environmental crisis and economic inequality, as well as the opportunities created by market reforms. The text is supplemented with a useful glossary and more than thirty key documents illustrating the momentous changes China has experienced through revolution and reform." Acknowledgements. A note on romanization and pronunciation of Chinese words. List of figures. Chronology. Who's who. Glossary. Map. Part One: China's Past 1. General Introduction 2. Geographical and Historical Background Part Two: China Under the Communist Party 3. China's New Revolutionary Road, 1949-57 4. The Radical Maoist Phase, 1958-76 5. Building Reform-Era China, 1977-89 6. Deepening Reform: China in the 1990s 7. Challenges in the 1990s 8. Social change after 2000 9. China Under President Hu 10. President Xi and the Chinese Dream 11. China and the World Part 3: Assessing China's Rise Part 4. Documents Further reading. References. Index.